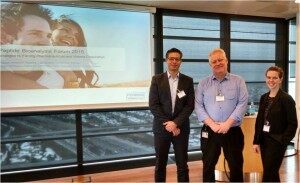 Close to sixty scientists from across Western Europe gathered for the Peptide Bioanalysis Forum held on-site at Ferring Pharmaceuticals A/S in Copenhagen on February 3-4, 2015. A collaborative effort between Ferring Pharmaceuticals and Waters Corporation, the proceedings kicked off with introductions by the organizers, Dr. Magnus Knutsson, Director of LC-MS/MS Bioanalysis at Ferring, and Dr. Diego Rodriquez-Calabeiro, DMPK Marketing Manager for Europe and India at Waters. Attendees hailed from small and large pharma, biotech, CROs, and from five universities across the region. Presentations from invited speakers represented both the pharma and CRO industries, and focused on the bioanalysis of large therapeutic peptides and proteins, monoclonal antibodies, and oligonucleotides. Highlighted technologies extended beyond traditional tandem quadrupole mass spectrometry to include the use of microfluidics, ion mobility, and high resolution mass spectrometry. One speaker predicted that HRMS, (historically used in qualitative analysis) will continue to gain acceptance in quantitative bioanalytical labs and may soon comprise as much as 20% of these labs’ instrumentation, especially with the newer, more sensitive HRMS instruments coming on the market today. 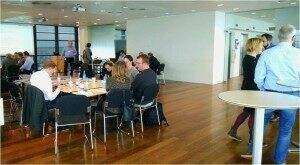 The 2nd day began with roundtable workshops focused on 3 main topics: Bioanalysis of Proteins & ADCs, Solutions for Further Improvements in Sensitivity, and Handling of Small Sample Volumes. Groups rotated between three facilitators, Diego Rodriguez-Calabeiro, Magnus Knutsson, and Dr. Erin Chambers, Principal Scientist at Waters, to discuss the challenges they face in these areas and the strategies they are employing to forge ahead. The majority of workshop attendees were experienced in bioanalysis of peptides, while others were relatively new to the field. Much discussion focused on measuring intact vs digested proteins, the use of immunoprecipitation in sample preparation, both general and specific, and the unmet need for instrumentation to support quantification of intact proteins and monoclonal antibodies, especially with the growing number of antibody-drug conjugates (ADCs) in development today. Many emphasized the need to bridge the gap between internal ligand binding assay (LBA) and mass spectrometry groups so as to collaborate more effectively on method development in order to minimize redundancy. Led by Erin Chambers, the afternoon session covered a practical delivery of guidelines for method development specific to peptides and proteins. Erin introduced the importance of “Understanding your Molecule” and all of its associated properties to best optimize method parameters. She offered concrete examples of methods developed by her team at Waters for the bioanalysis of insulin and its therapeutic analogues, teriparatide, desmopressin, and even larger proteins such as herceptin and infliximab, among others. Response to the Peptide Bioanalysis Forum was exceptional. Individuals remarked at how helpful it was to share their ideas in such a collaborative environment amongst their peers. An enormous thank you to all who participated and to Ferring for their gracious hospitality.